Recent downtown developments have revealed the need for upgrades to hydro service in the downtown, as well as a policy on burying hydro lines, and who pays. Staff have made a series of recommendations that will be considered at the Development & Infrastructure Committee Mon. Feb. 25 summarized below. Much of the downtown is serviced by 4kV lines, which are adequate for low and medium density residential and mixed-use development, but are inadequate for recent higher density developments in the downtown, which have all required upgrades on a project by project basis. Because of the continued growth expected in the downtown to meet our provincial intensification targets of 200 person/jobs per hectare, it will be necessary to upgrade hydro service to 27.6kV throughout the downtown. Hydro burial has some advantages in compact areas like the downtown. 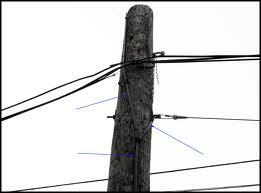 As such, city staff are recommending a Hydro Services Policy be formalized whereby new power lines in new residential areas would be underground; new power lines in new non-residential subdivisions would be overhead; reconstructed power lines would remain overhead; and existing overhead electrical systems in specifically designated areas would be buried, where the benefits of burial outweigh the cost. the most efficient use of the site and a more urban form of development. Hydro burial is more expensive than overhead service (as much as four to ten times more than rebuilding an existing overhead system.). The projected cost to upgrade service downtown is approximately $20 million, of which approximately 30 to 40 percent ($6 to $8 million), is attributable to burial. For recent developments, including Bunton’s, The Baxter, 360 On Pearl, as well as the Reichman senior’s development now under construction, the hydro upgrades were all paid for entirely by the developer. Historically, however, city council has contributed. Ten downtown streetscaping reconstruction projects with hydro burial were approved in the 80s and 90s, with the city picking up 100% of the hydro burial costs. This amounted to approximately $6 to 8 million. 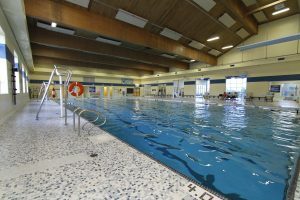 Most recently, the city spent approximately $2 million for the burial of hydro along Elgin Street as part of the Burlington Performing Arts Centre project. The city currently has no Council approval for city funding or city contribution towards hydro burial. Developers continue to pay 100% on a project by project basis. Hydro pays 33% of the cost, developers 66%. Burlington Hydro is supportive of this option, as there is some precedent: they currently provide roughly 33% rebate to green field development for newly installed hydro works in recognition of new customers. Hydro pays 33%, the city pays 17%, developers pay 50%. 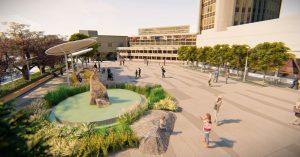 Recognizing that the beautification associated with burying hydro downtown will benefit both new development projects as well as fulfilling the city’s interests, city staff could support funding a portion of the burial costs (approximately17% of the $20 million total cost, or $3.4 million). There would be an estimated return on that investment in 5-10 years because of the increase to developable area, and thus assessed taxes, by burying hydro wires. Staff are proposing a fixed term of this program of 6 years to foster development and allow for review. Staff are requesting Council direction to review funding options and implications and to report back to Council with a recommended funding strategy. To read the full staff report with Appendices A, B, and C.
My Take: I support the continuation of the long-standing practise of burial of hydro wires downtown, and am open to the hydro-city-developer funding option, to promote aesthetics and tree preservation. Your View: Do you support hydro burial downtown? If so, who should pay? Post a comment on my website here or email me at marianne.meedward@burlington.ca. I support hydro burial downtown. However, I do not think that it should fall to the taxpayer to pay for this. This should be a shared cost between Hydro and the developer. It is the cost of doing business. We certainly pay enough for Hydro and pay a premium for condominiums built in the downtown core.